For a long time, Irish food tended to be seen as just an endless procession of stew, cabbage, and potatoes. Actually, Ireland's menus can be quite surprising, and a unique experience. So "when in Rome..." or rather when in Ireland, do as the Irish do. And when it comes to food and drink, the tourist should endeavor to at least try to savor local specialties. You can have steaks, burgers and buffalo wings any day at home, can't you? But have you ever tried a real coddle, an Ulster fry, or oysters with Guinness? The good old Irish stew once was a typical peasant dish, but current prices in Irish restaurants might put it more within the culinary sphere of the gentry. Basically, a thick casserole containing lamb or (rarely today) mutton, onions, parsley and a generous helping of potatoes. The meat may be diced or minced, peas and carrots might liven up the dish a bit. Depending on the cook the stew can also be almost soup-like. Beef and pork stews are almost the norm today... times are a-changing. If you want to give it a spin yourself, try the recipe for Angie's Irish Stew. Also known as a "fried breakfast" or locally an "Ulster fry," the full Irish breakfast will combine any or all of the following—eggs (fried or scrambled), sausages, bacon, black and white puddings (a type of sausage), mushrooms, baked beans, grilled tomato, potato farls and fried bread. All accompanied by slices of toast, jam, marmalade, sauces and copious amounts of tea or coffee. Basically, a day's intake of calories in one sitting. Also known as "heart attack on a platter"—but extremely enjoyable. For those on the move, the Breakfast Roll praised in song and immortalized in economics might be an alternative. 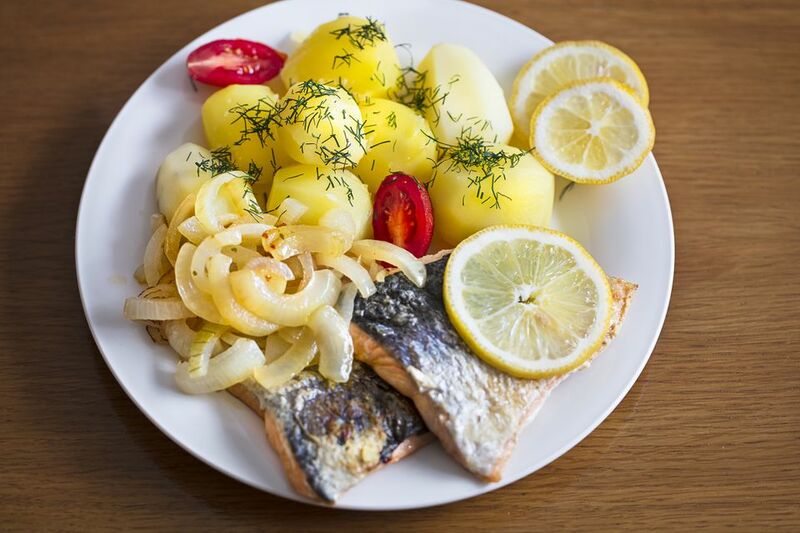 Regarded as a delicacy in other countries, salmon was one of the most common fish in Ireland and a staple ingredient of the Irish kitchen. The usual way of preparation is poached in fish stock, this then being served with peas and potatoes. Fried salmon is popular as well. Exotic dishes such as pasta with salmon are slowly catching on. The most popular way to enjoy salmon is simply smoked, either on bread, with scrambled egg or simply on its own with a salad side. Farmed salmon can be rather pedestrian—the flavor of wild salmon tends to be better. Unfortunately, the price of wild salmon tends to be significantly higher as well. Only widely available outside the main tourist season, these once were food for the poor. Oysters were plentiful and free on the Irish coast before they became a delicacy and an aphrodisiac in "better circles." Normally served on ice with a helping of seaweed, a no-frills food. The traditional side dish would be a pint (or several) of Guinness. This combination can be ordered for a moderate price especially around Galway. Definitely not a poor man's dish, the traditional Irish ham was coated with sugar and dressed with some cloves, then baked until crisp on the outside, tender on the inside. Generally served with loads of boiled cabbage and cooked or fried potatoes. This is quite a festive meal and not everyday fare, not even for the well-to-do. Bargains can be had in some pub carveries, however. Even though suicidal lambs and sheep may provide your daily bit of frisson on Irish roads, their meat is actually quite expensive. The best parts are fine cutlets or a traditional rack of lamb. Both are accompanied by, you guessed it, potatoes and sometimes served with mint sauce or jelly. Again not an everyday dish—and bear in mind that the taste of lamb can be an acquired taste. This is the common dish for Dubliners on a Saturday night before they "hit the tiles" (go out). It is a good basic dish consisting of chopped sausages and bacon cooked together with onions and the ubiquitous potatoes in beef stock. Filling, satisfying and guaranteed to provide a good basis for the drinks to follow. It is also easy to make in quantities and can be reheated the next day. The typical Irish vernacular for a sandwich, encompassing anything from the factory-produced, plastic-wrapped emergency rations available nearly everywhere to the freshly made platters at O'Brien's. All sorts of weird and wonderful ingredients make up the filling, from the old favorite "ham & cheese" to "stuffing & coleslaw." Advertised nearly everywhere, usually served with bread and butter and a very good value snack at lunchtime. In a typical Irish way the question "What is the soup of the day?" will, in nine out of ten cases, be answered with a shrug and "vegetable."